E-Stamp Paper is a computer-based application and a secured way of paying non-judicial stamp duty to the government. The E-Stamping system launched in association with Stock Holding Corporation of India Ltd (SHCIL) has been designed to prevent paper and process-related fraudulent practices in registration. The Karnataka State Government introduced the E Stamp paper in bangalore in the state in 2008 to prevent paper and process-related fraudulent practices in registration. E-Stamp Certificate can be generated within few minutes. E-Stamp Certificate generated is tamper proof. E-Stamp Certificate generated has a Unique Identification Number (UIN). Authenticity of the E-Stamp certificate can be checked online. Specific denomination is not required. 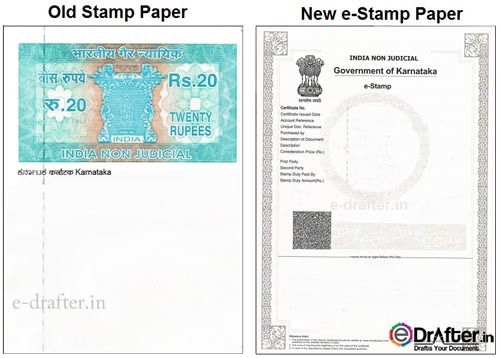 e Stamp paper in Bangalore can be purchased through Sub-registrar office (though due to some server issues generally they don’t provide e-stamp paper), designated to supply e-stamp papers and designated banks. You can get the e-Stamp Paper online as well through our this Section – Purchase e-Stamp Paper for Karnataka Just Fill the given Form and we will procure e-stamp on your behalf from designated Bank and will deliver it to you. Rs. 20 – Used for Affidavits. Rs. 50 – Used for Various Agreements. Rs. 100 – Used for Rental Agreement/Lease Agreement and Indemnity Bonds. Rs. 200 – Used for Declaration. Rs. 300 – Used for Agreements with Payment Gateways. Rs. 500 – Used for Adoption Deed, Certificate of Enrollment. 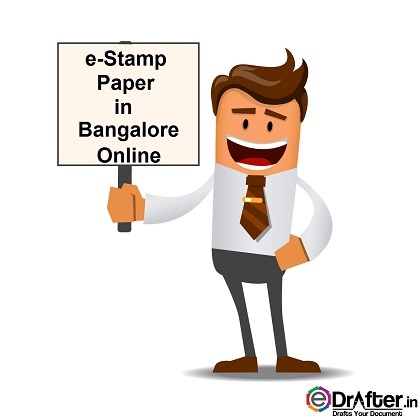 How to Get e Stamp Paper in Bangalore ONLINE ? Fill the name of the first party which can be the person/organisation in whose behalf Stamp Duty is going to pay.Like, Rajesh Krishnan wants to make e-stamp paper on his name so he will be considered as first party and will write his name. Now fill the second party name (If any), Fill the name of the purchaser who is purchasing the e-Stamp Paper like Rajesh Krishnan is purchasing so he will write his name in purchased by. Fill the description/purpose of e-stamp paper for which you are going to purchase e-Stamp Paper like Rental Agreement. Choose the stamp duty amount for e-stamp paper from available options. Now choose who pay stamp duty either first party or second party. Quantity can also be selected. That’s it! Now we will prepare your Order and will Deliver it to you at your place!